- The first one (36 airplanes), Serial A-5 was made up of the 49th TCS and 29th TCS. The 3rd Battalion of the 513th PIR was transported (at least in part) with the 29th TCS. - The second one (36 airplanes), Serial A-6 was made up of the 48th TCS and 47th TCS (this last TCS transported the HQI Cie and probably so the 1st Battalion (completely or partially)). The men take off at 08h00 AM. The 513th PIR must jump on the Drop Zone X, north of Wesel, Germany . The flight was quiet but the fog creates by the British artillery and the intensity of the German anti aircraft artillery (Flak) made some trouble in the Allied armada. It resulted that the men of the 513th PIR were dropped in a wrong place, too much on the north of their Drop Zone, in the area of the British Drop Zone P (near Haminkeln). Because of this intense Flak and the weakness of the new C-46 airplanes, 16 planes are shot down and 7 must landed in emergency. At least 29 men of the 513th PIR died before having a chance to jump ! Sunday March 24, 1945. Let's go for the last and biggest Airborne operation of the WWII ! This famous photo was realised in early morning of the D-Day (before 08 AM) in the airport of Achiet, France (B-54 airport). 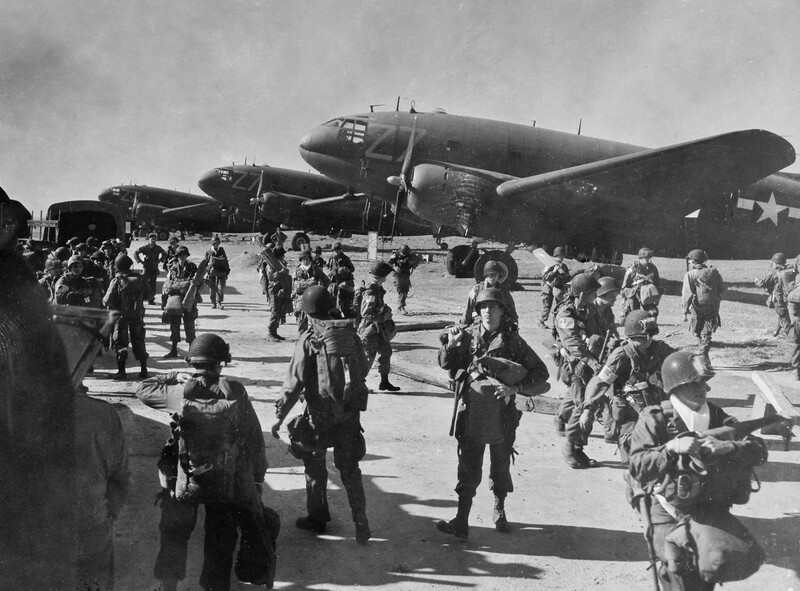 It shows paratroopers of the 513th PIR (from the 1st or 2nd Battalion) ready to load on the new Douglas C-46 planes of the 48th Troop Carrier Squadron (TCS) (code Z7) - 313th Troop Carrier Group (TCG) - 52nd Troop Carrier Wing - 9th Troop Carrier Command of the 9th US Army Air Force (National Archives). Click to enlarge. The whole regiment is on the ground at 10h25, located 2 to 3 kilometers more on north of its objective. The 3rd Battalion under command of Lieutenant Colonel Edward F KENT is on the east of the wrong drop zone. The mission of the unit is to capture and secure positions along Issel river and make contact with men of the 6th British Airborne Division on north and 194th GIR on south but it is now divided into several little groups that finally join the good assembly area around 15h30. The 513th PIR makes finally junction with the 6th British Airborne and 194th GIR at 17h00. The unit loses approximately 230 men in the 48 first hours of invasion. It was during this fighting that Pfc Stuart S. Stryker seeing his unit's exposed position ran to the front of his unit. He found his platoon leader and platoon sergeant laying dead. Acting on instinct he rallied his fellow paratroopers in a wild rush toward the enemy positions. Just short of the enemy positions he was riddled with machine gun fire and fell dead. However, the remainder of his platoon overtook the enemy position capturing two hundred Germans and freeing 3 American bomber pilots. For this heroic action Pfc Stryker was posthumously awarded the Medal of Honor. By mid-afternoon on March 24, 1945 the 513th had secured all of its objectives including the capture of 1100 German prisoners. These radio operator photographed in a fox-hole on the D-Day of the Rhine crossing is a member of the 513th PIR. The location of the scene is probably in the vicinity of Hamminkeln as the 513th PIR was misdropped. The paratrooper doesn't seem worried by the the large amount of German prisoners lined up front of him ! (National Archives). Click on the pic to enlarge. The 513th PIR stays on its positions till March 26th when it takes the offensive to capture the high grounds located west of the city of Brünen. During the night, the 3rd Battalion is attached to the British (Armored) Cold Stream Guards. The unit carries on its offensive toward the city of Holsterhausen and Haltern am See on March 28. 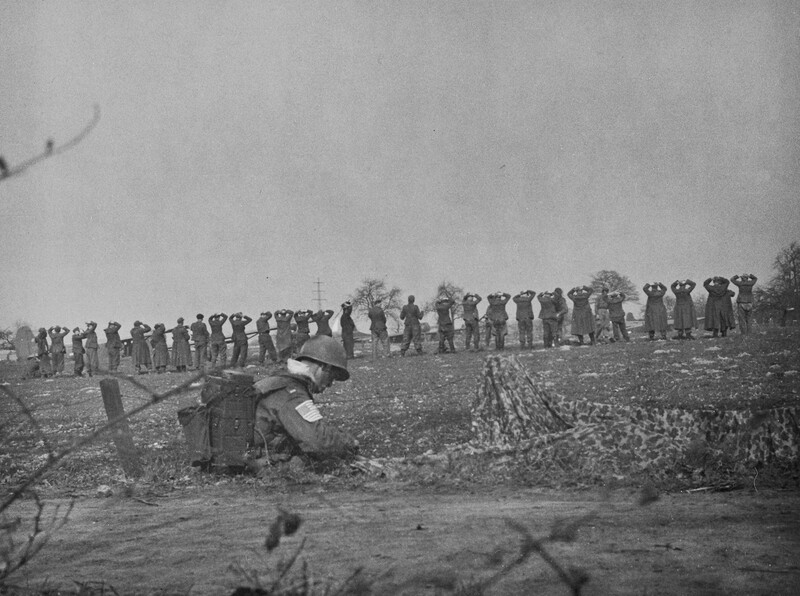 The cities of Haltern and Dülmen are captured by the unit on March 29 with the 3rd Battalion in the head of the attack. The offensive for Munster starts on March 30. These photo is extracted from the Star & Stripes journal from March 30, 1945. 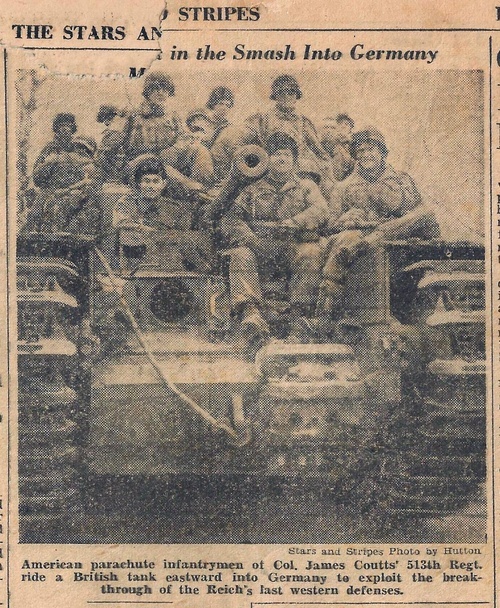 It shows troopers of the 513th PIR on English tank (TFH collection). The 513th arrives on the outskirts of Munster on sunday April 1st in the late afternoon. The local German commander refused the surrender. 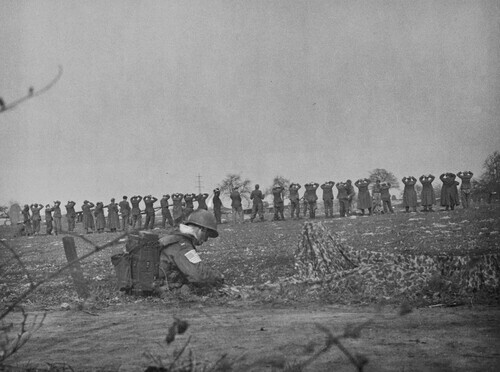 The last offensive launched on the city starts the next day with 3rd Battalion on south west. It is during that fighting that the Commanding Officer of the 513th PIR, Colonel James W Coutts is badly wounded. 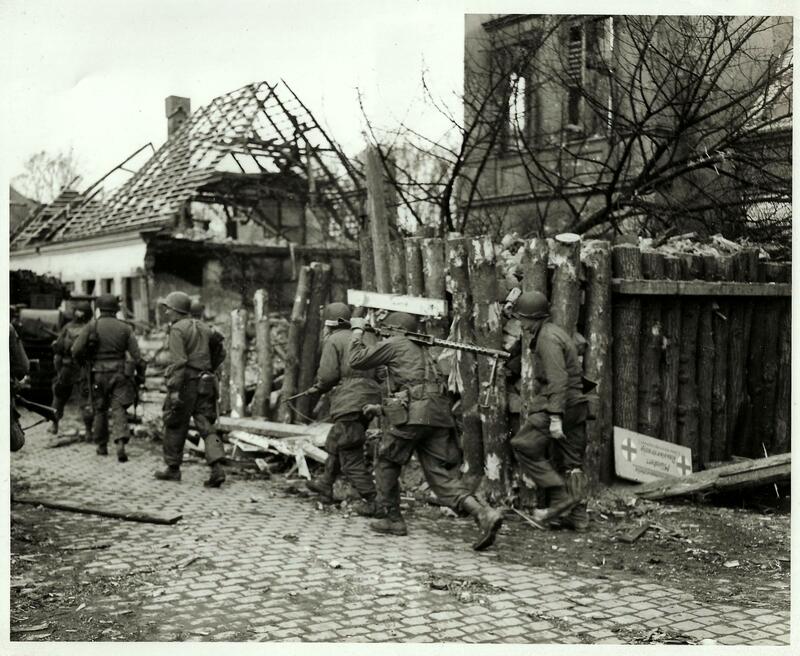 The legend of this photo realized on April 2, 1945 says : "Infantrymen of the 513th Airborne Infantry Regiment, 17th Airborne Division, fighting with the U.S. Ninth Army, pass through a road-block in the frontline city of Munster, Germany. These troops were the first Allied troops to arrive in the city. 1st and 3rd Plat. Co. C. 513th Airborne Inf. Regt., 17th Airborne Div., U.S. Ninth Army. 4/2/45.". (National Archives - original photo TFH collection). Click to enlarge. The war finally ended a month later on May 7, 1945 when General Alfred Jodl signed the unconditional surrender to the Allied powers.